Whether it’s an election or issue lobbying campaign, if you do the planning you need to do on the front end, you’ll save yourself a lot of time and headache later, not to mention increase your chances of being successful. Remember, “if you fail to plan, you plan to fail”. This is not about “running” a campaign, but how to plan one – and how to do the research and make the evaluations that you need to make in order to decide what kind of strategy and tactics you should use. That’s what this book is about. It’s written to help you go through a step-by-step process of doing the things you need to do, in the general order you need to do them, to develop a plan for your campaign. I’ve spent a good bit of time working to make sure that it covers what you need to know, but does so in a way that’s incredibly easy to follow. You get the lessons learned from over 25 years of experience for just $19.95! Once you’ve got a plan, it makes it much easier to know “what’s next” on a day to day basis, and it’s easier to determine what you should do, based on what you have determined is important. It will give you confidence as you go forward because you will have thought things through, and you’ll know “why” it’s better to do things this way or that, not just guess or roll with the flow. 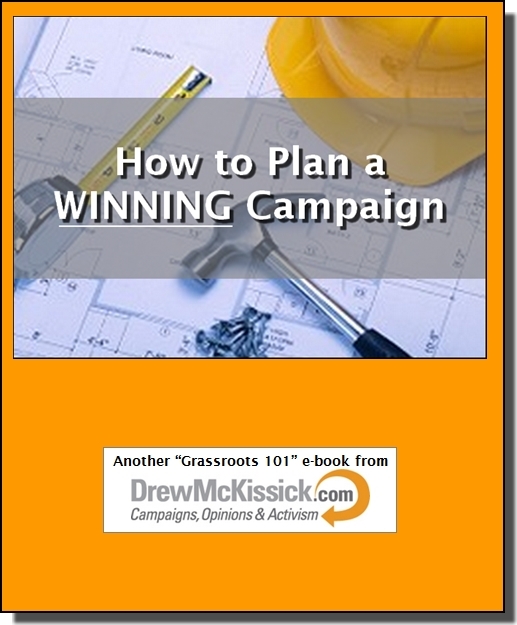 Is your campaign worth $19.95? If it’s worth RUNNING, it’s worth PLANNING. You’ll be glad you did it right. This book shows you how! Click Here to Order now via Amazon.com!